Combined heat and power solution provides energy efficiency, cost savings and environmental benefits for Capitol Hill campus. 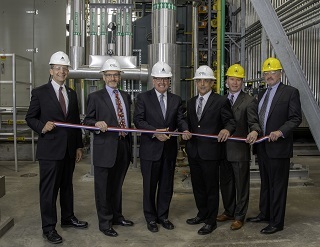 WGL Energy Systems, Inc. (WGL Energy) recently announced the completion of a 7.5 megawatt (MW) natural gas cogeneration system developed in partnership with the Architect of the Capitol. The new facility is designed to deliver a reliable, energy-efficient source that will save taxpayer dollars and reduce environmental impact, while providing steam to the 23 facilities served by the Capitol Power Plant, including national landmarks such as the U.S. Capitol, The Library of Congress and the Supreme Court of the United States. From left to right: Christopher Potter, Director, Utilities and Power Plant Operations at the Architect of the Capitol; Tony Nee, Vice President, Strategy, Business Development and Non-Utility Operations at WGL; the Honorable Stephen T. Ayers, eleventh Architect of the Capitol; Tim Haines, Chief Operating Officer, WGL Energy Systems; Scott Clark and Ken Woodul of the Architect of the Capitol. In 2015, the Architect of the Capitol, which runs the maintenance, operation, development and preservation of 18.4 million square feet of buildings on the Capitol campus and ensures these facilities meet current sustainability standards, awarded a Utility Energy Service Contract (UESC) to Washington Gas Light Company, an affiliate of WGL Energy, to perform the design, build and install of the cogeneration solution. WGL Energy served as the general contractor and project manager. The new system is part of a modern energy plan initiated by the Architect of the Capitol to add proven cogeneration energy technology, also known as combined heat and power (CHP), at the Capitol Power Plant. The Capitol Power Plant’s cogeneration system, delivered by WGL Energy, uses natural gas in a combustion turbine, enabling the Architect of the Capitol to generate its own electricity and heat, as well as deliver a reliable source of chilled water and steam, to improve system reliability and self-sufficiency and support energy cost savings across the properties it manages. “We have set a goal here at the Architect of the Capitol of a 50 percent reduction in our energy use intensity over our 2003 baseline, and as we mapped out how we are going to reach that goal, this cogeneration project is the single biggest contributor to our success,” said Architect of the Capitol Stephen T. Ayers, FAIA, LEED AP. During each phase of construction and implementation, experienced project partners contributed time, expertise and talent, including primary subcontractor and Engineer of Record Burns & McDonnell, and local-area contractors RMF Engineering, Marchuk Construction Company and Atlantic Constructors (ACI). WGL Energy has more than 300 megawatts (MW) of distributed generation projects installed or under contract across 20 states and the District of Columbia. To learn more about WGL Energy's cogeneration technologies and on-site energy solutions, visit our website at wglenergy.com.